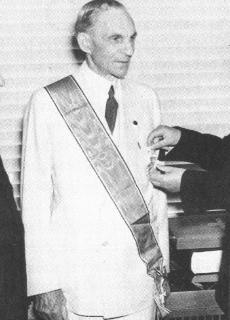 Henry Ford receiving his Grand Cross of the German Eagle from the Nazis for his work on the International Jew. Founder of the Ford Motor Company, and publisher of the Dearborne Independent news paper that blames all things wrong with the world on Jews. *note the interesting lodge names for someone that thinks the Jews are the root of all evil. For his work named “The International Jew” that blames all world government on the Jews, Hitler awarded him with a metal/honor called the Grand Cross of the German Eagle.